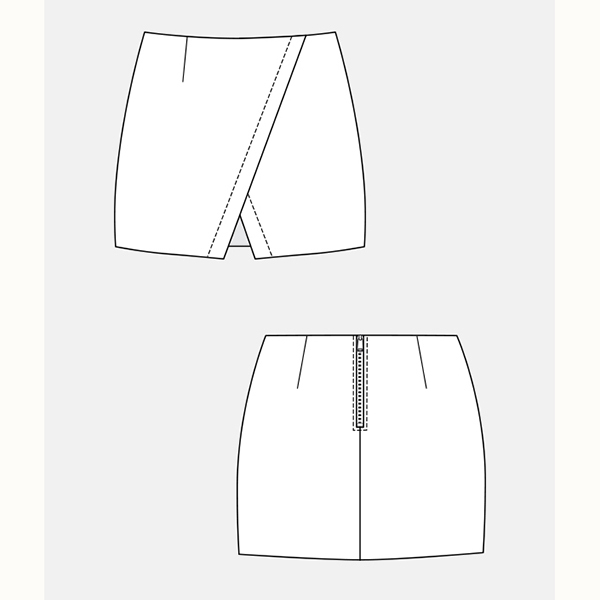 I’ve been talking about making this really lovely cute Mini Skirt from Named Patterns, the Nascha, for a while now. I think it’s a great take on a classic mini with a nice design detail at the front to keep things interesting. 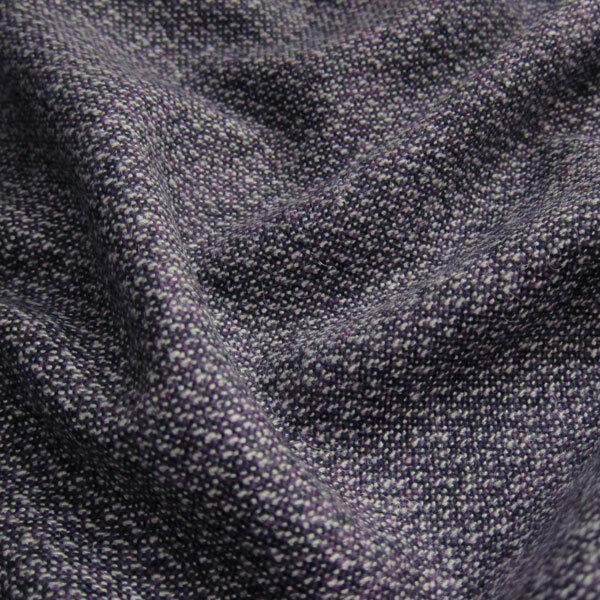 Ever since we had all of our woollen fabrics arrive for winter I’ve been dreaming up several versions but decided to use this lovely textured purple one, which has flecks of white a black as well. I’ve made a few of the Named patterns now and have always been really pleased with the finished garment. The way the garments hang and the details in how they are put together are just they way I like, but it can be a bit trickier than normal to get there. I like it though and a challenge is always good! Here are a few pointers that I wished I’d know before I started! The first thing to be aware with these patterns is that it's best to trace your size and watch out for the seam allowances situation. Each size has two lines; one excluding seam allowance and one including seam allowance of (watch out for this bit too) 1cm! Not what you might be more used to with a 1.5cm. These aren’t complicated or difficult things to over come, just something to be aware of! With this particular pattern, as its asymmetrical, you won't cut the front panels out with the fabric on the fold as you normall would. The right and left panels are different so you just need one piece of fabric for each side – and make sure that you don’t end up with two right or left hand pieces! 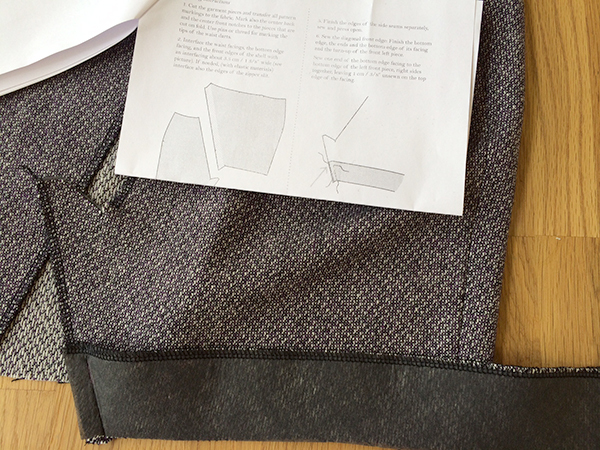 The instructions, although supported with diagrams show the wrong side of the fabric as shaded grey and the right side white. Whereas on quite a few of the other indie patterns that I’ve used before, it’s the opposite way around. So again, not that bad to work around just something to be aware of and it might be worthwhile making a note on your instructions of that. It just took me a bit longer than normal to work out what way round things were going. 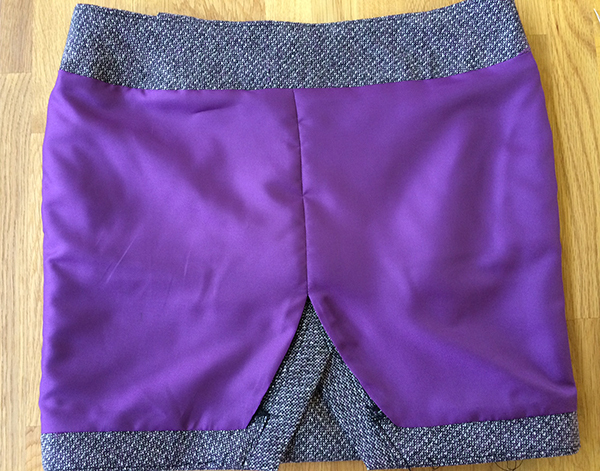 One of the features I like about this skirt is that it has a hem facing and the lining is attached to the waistband facing and the hem facing, meaning it doesn’t flap around of its own accord. The things I’d recommend you watch out for here are that; when attaching the hem facing, you only do one half at a time. It’s because of the way the two front panels join together and it was one of those situation where you just have to trust what the instructions say, go with it, and hope it all makes sense at a later step – which of course it did. I found when doing the line of top stitching on the longer diagonal front panel, that I had to measure and mark a line of where to stitch with chalk. Sometimes I take shortcuts in situations like that and just go by feel, but it was going to be too messy. The chalk line worked a treat and brushed off the wool really easily afterwards. 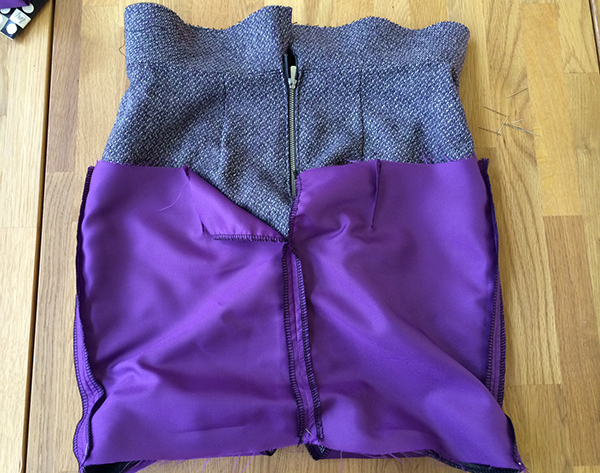 When attaching the lining, you first attach it to the hem facing, then the waist facing second. 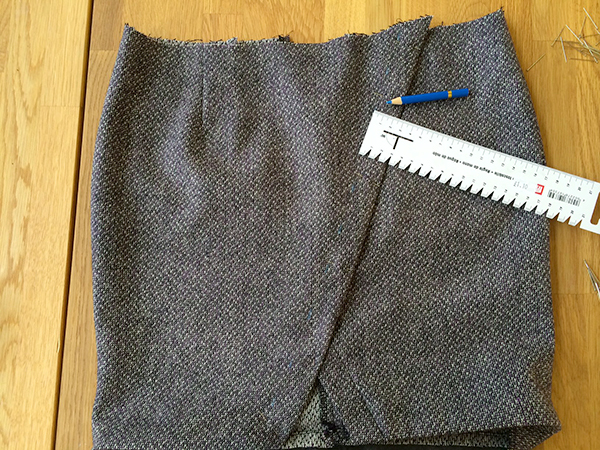 Attaching it to the waist facing is where the really tricky bit comes. 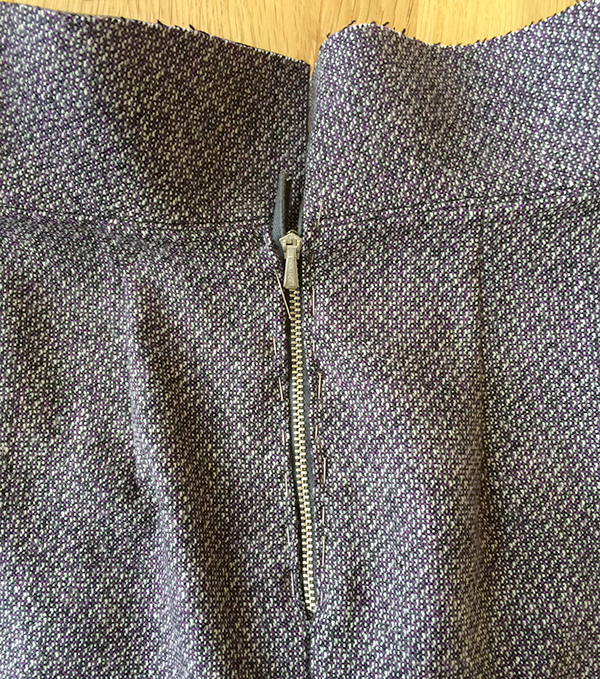 You have to pull everything through where the zip is at the back so that the lining and facing can be sewn with right sides of the fabric facing. 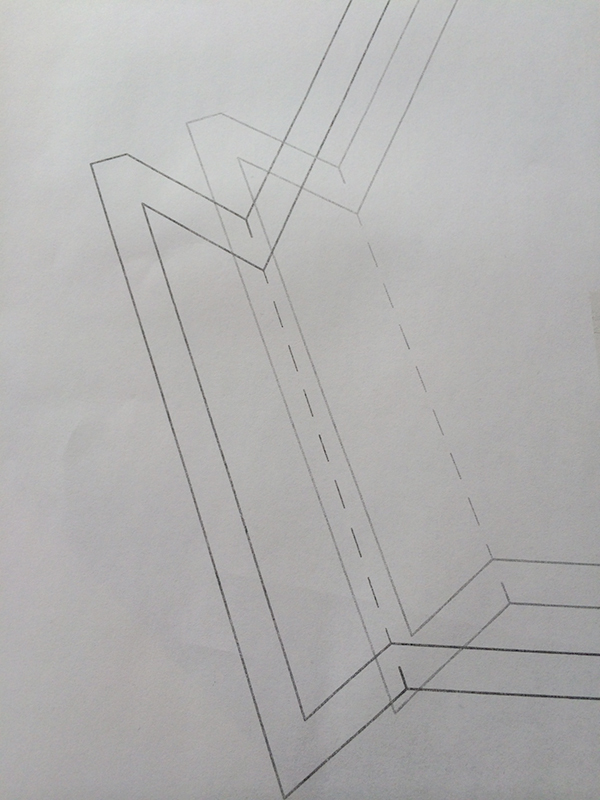 It’s really hard to explain and show in diagrams and photos, but I honestly think that if you just don’t worry about working it out until you get to that stage, and just follow exactly what it says in the instructions with your skirt in front of you, then it’s not too bad to work out. Over a few evenings, I managed to finish the skirt to the point of hand sewing the lining to the zip but alas, when I tried it on, my behind just doesn’t fit in it very well. I’m soooo disappointed as although it is possible for me to get the darn thing on and zipped up, if I move more than a cm, I fear the back seam will probably burst open! I’m going to try and let it out at the seams a little and hope that I get just enough ease to be able to walk in it, otherwise, it’ll just be another hard lesson learned. 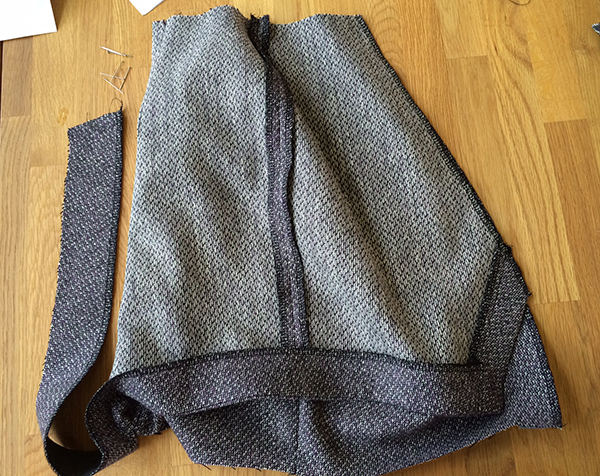 My top tip – seriously consider increasing the seam allowance or if you are on the cusp of a size – make the next one up! What have you lovelies been making? Would love to see some pictures!